How Bad Bunny Skipped Categories And Skyrocketed To Fame No, he's not a cartoon character. 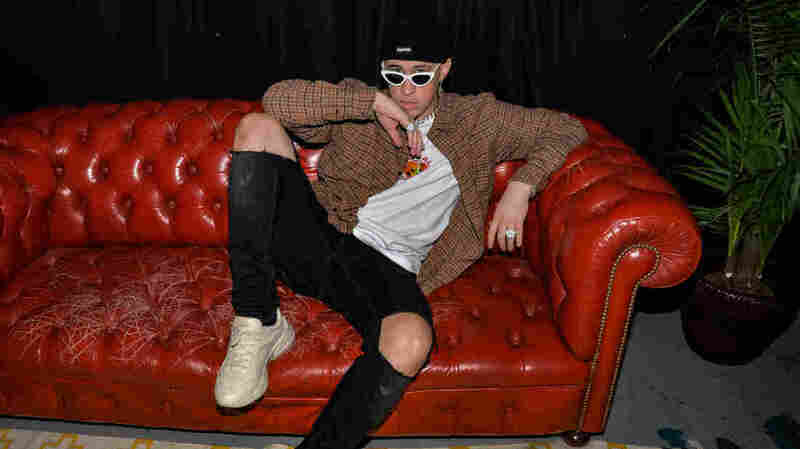 Bad Bunny is the up-and-coming Puerto Rican rapper soaring to international fame. Bad Bunny backstage at Apple Music's 'Up Next' Artist concert in Miami, Fl. in March 2018. Before Benito Antonio Martínez Ocasio became Latin trap star Bad Bunny, he was just a kid growing up in Puerto Rico whose mom would blast salsa and romantic Latin ballads on weekends. "On Sundays and Saturdays, when it was time to clean the house, when I heard those records, I knew I would have to at least mop the floor or something," he says with the help of an English translator. But after cleaning, Bad Bunny says he would lock himself in his bedroom and listen to Island rappers Daddy Yankee, Tego Calderón and the godfather of Puerto Rican hip-hop, Vico C.
Soon, he started practicing his own raps. A self-described class clown, Bad Bunny got his stage moniker from the time he was forced as a child to wear a bunny rabbit costume. He was pretty angry about it, but the name stuck. In the last year or so, Bad Bunny has hopped with ease into the English language market, guest starring on tracks by such rappers as Nicki Minaj, Drake and Cardi B. Bad Bunny's rise to stardom is (mostly) his own doing. He started posting music on SoundCloud around 2016, singing and rapping only in Spanish. He now has billions of streams on platforms like YouTube and Spotify and a Grammy nomination for record of the year thanks to "I Like It," his collaboration with Cardi B and J Balvin. Isabelia Herrera, music editor of the online magazine Remezcla, says Bad Bunny's successful crossover is a testament to changing U.S. demographics. "Demographically, this country is Latino," she says. "People are no longer like, 'We don't understand what that is. We don't understand that this is in the Latino world.' There's no longer that barrier." Bad Bunny's success rests on more than his music. In a world of macho rapper caricatures, he boasts about stealing your girl while rocking a gender bending style: Polished nails, flamboyant, colorful jackets and get-ups that would make David Bowie tip his fedora in admiration. "I can simply tell you that since I was a kid, I didn't like to look like anyone else," Bad Bunny says. He doesn't sound quite like anyone else either. The artist's debut full-length album, x100Pre (Forever), stays true to his trap music roots. Bad Bunny's low, nasty drawl and rhythmic, choppy Puerto Rican Spanish dance over dark, deep beats on the song "Quien Tu Eres" ("Who Are You?") But there's also plenty of experimentation on the album, too. Fans hear folksier guitar, shiny pop, and, without a doubt, the influence of his childhood chore time when he was forced to listen to his mother's romantic ballads. "Solo De Mi" ("Only My Own") is a ballad of independence. The accompanying music video was part of a campaign against domestic violence that features a battered woman singing the words. "I always like to create things that get attention," Bad Bunny says. "It used to be a problem when I wasn't famous. Now, I can do whatever I want and people have to accept it." This from a musician who's able to skip categories with so much ease because he belongs to none.